Multi talented Ghanaian Actress, Nana Ama Agyeman widely known as Nana Ama McBrown has finally put to rest rumours that she is pregnant. 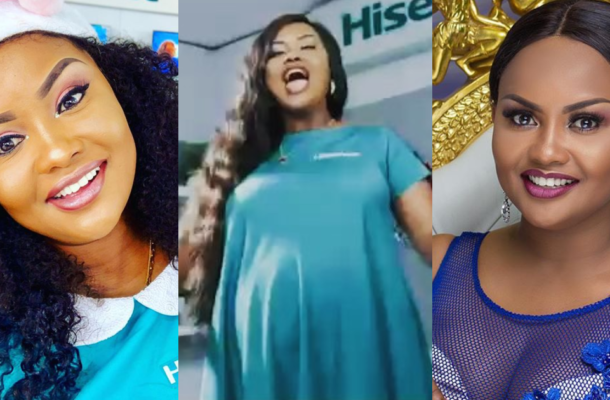 The 'Side Chick Gang' actress has been widely reported to be pregnant since August 2018, a rumour she kept quiet about. In the video, McBrown could be seen heavily pregnant with a protruding belly which clearly indicates that she is pregnant and may be due to give birth soon. The video happens to be an advertisement for HiSense, one of the many brands McBrown represents was captioned: "He that dwelleth in the secret place of the most High shall abide under the shadow of the Almighty." At a point in the advert, McBrown could be heard joyfully saying "we are pregnant with some much more promotions" as she touched her belly. In an interview last year, Nana Ama who said she has refused to bow to pressure indicated that she is very optimistic that very soon she will have her bundle of joy. Nana Ama McBrown came onto the scene almost 19 years ago and she has carved a niche for herself. Due to her versatility, she has starred in numerous English speaking and Kumawood movies making her one of the best celebrities we have around.